Now immortal, and living in the gnarled and arthritic body of an old woman, Tilo has set up shop in Oakland, California, where she administers curatives to her customers. But when she's surprised by an unexpected romance with a handsome stranger, she must choose between everlasting life and the vicissitudes of modern society. 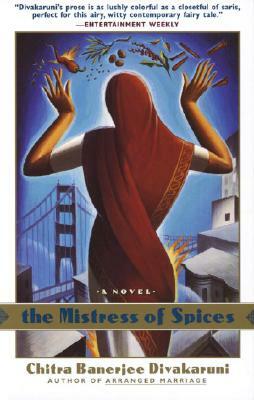 Spellbinding and hypnotizing, The Mistress of Spices is a tale of joy, sorrow, and one special woman's magical powers. Chitra Banerjee Divakaruni is the author of the novels Queen of Dreams, The Mistress of Spices, Sister of My Heart, Before We Visit the Goddess, One Amazing Thing, Oleander Girl, and The Vine of Desire, and of the prizewinning story collections Arranged Marriage and The Unknown Errors of Our Lives. She lives in Houston, Texas, and teaches creative writing at the University of Houston. "An unusual, clever, and often exquisite first novel...The result is rather as if Isabel Allende met Laura Esquivel." "Divakaruni's prose is so pungent that it stains the page, yet beneath the sighs and smells of this brand of magic realism she deftly introduces her true theme: how an ability to accommodate desire enlivens not only the individual heart but a society cornered by change." "The Mistress of Spices is a dazzling tale of misbegotten dreams and desires, hopes and expectations, woven with poetry and storyteller magic." "A splendid novel, beautifully conceived and crafted."